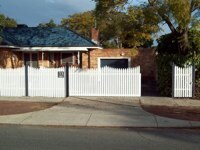 Perth Picket Fencing is Perth's premier Timber and Colorbond fencing company. 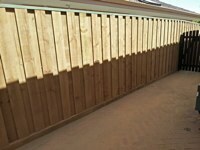 We supply and install all types of timber fencing to the Perth metro area. From Gothic Picket Fences, Jarrah Paling, Slat Infills, Timber Screens, Pinelap Fencing through to Colorbond, Gates and Pool Fencing. So, no matter how big or small your fencing project is, Perth Picket Fencing have a solution to meet your needs. We pride ourselves on providing a prompt and professional service, and we only use premium materials for construction, providing you a much higher quality finish and longevity to your fence or gate. For a free measure and quote contact Steve on 0410 386 818. Or, leave your details via the contact form and we'll contact you. Timber boundary fencing is a great alternative to the typical Colorbond or fibro fence. 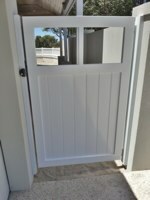 Whether it be a Pine Lap fence or Jarrah Paling fence you can be assured that a Perth Picket Fencing timber fence will exceed your expectations for both strength and beauty, and the solid timber fence has excellent noise absorption qualities. Timber fences won’t rust or dent with everyday use and won’t radiate or reflect heat in the harsh WA environment. For a modern look timber fence we recommend Pinelap Fencing. The wood is attractive, strong and CCA treated for protection against termites and rot. The timber can be left natural to age gracefully we provide a painting service, and can stain or paint your new Pinelap fence to a colour of your choice. Pinelap has been the first choice of many new housing estates for its beauty and strength. Pinelap is installed with timber posts concreted into the ground or alternatively with galvanized steel posts and we can install core drilled into brick or limestone retaining walls. 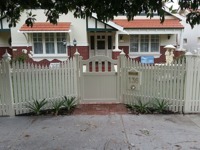 A Jarrah Paling or picket fence is a traditional Western Australian boundary fence. The Jarrah palings can be installed with square tops or pointed tops to suit your requirements. The timber can be left natural to age gracefully. 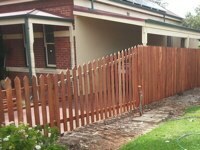 We also provide a painting service and can stain or paint your new Jarrah Paling fence to a colour of your choice. Jarrah Paling fences are installed with timber posts concreted into the ground or alternatively with galvanized steel posts and we can install core drilled into brick or limestone retaining walls. Expertly installed by our team, your new Pinelap or Jarrah Paling Fence will be one of the strongest, long lasting fences in the neighbourhood. It will withstand Western Australia’s harsh climatic conditions yet blend in perfectly with your landscaping. Please see our gallery for examples of our Pinelap Fencing and Jarrah Paling Fencing.